Hawks at Feeder - What To Do Now! Hawks at feeders is something you're bound to run into if you feed birds long enough. Generally, they stalk bird feeders out from a perching site or hovering high overhead. You may or may not even be aware of its presence, but the lack of birds at your feeder could be a good indication there is a predator nearby. Sometimes it throws you for a loop. You look outside at your feeders and you see no birds. For several days or even weeks, you've been watching all the different species of birds visiting your feeders, then, it seems all the birds stop visiting. You begin to wonder, "where have all my birds gone". Well, you may want to stop looking at your bird feeders and start looking at the sky and tops of trees. You may have a hawk in the area. What can you do? Hawks at Feeder - What Steps Can I Take? If you're not already aware, there are strict laws when it comes to these birds. Killing these birds brings pretty harsh penalties. Take down your feeders for a few days. The hawks will look elsewhere for food. Your feeder birds will leave to find food, but they'll soon return once you begin filling your feeders again. 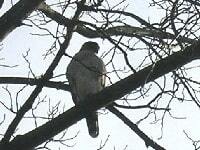 By this time hopefully the hawk will have located another hunting territory. Placing feeders to protect your songbirds is important. Brushy areas with tall or low to the ground bushes can give birds a place to hide until danger passes. If yours is a case where there isn't any natural cover, you can build a brush pile of trimmings from other plants. Pick up discarded Christmas trees and place them around your feeders. They will last all winter long and you can throw them out in spring. Consider purchasing bird feeders with wire cages that allow songbirds in but keep the hawks out. These types of feeders will keep the birds from being picked off without warning. There are many different types available and at reasonable cost. Some of your feeder birds are going to get caught, that's just the way it is. Hawks at feeders don't have to have a big impact in your yard if you put some of these ideas into practice..
Hawks and Owls help keep populations of rodents down and this is a good thing. None of us wants to see our little birds lost this way be we know the Raptors have to eat also. Don't stop feeding the birds just because you have Hawks at feeders. More of our birds will survive because of your feeders than will be caught. Let me just thank you for caring enough about our birds to even search this topic.